If you want to put a slide show on your home page, see first article below. There are many ways to add photo albums and slideshows to your website. 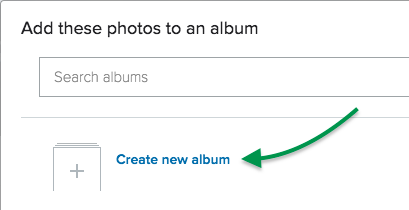 The basic process is to use some kind of photo storage site, generate embed code for an album or slideshow, then paste the code on a page in your SwimOffice site. We will show you how to do so using Flickr and a slideshow generator called FlickrEmbed. Both are free. Navigate to https://www.flickr.com and Sign In, or click Sign Up if you don't have an account and follow the process. Upload desired photos on Camera Roll page. 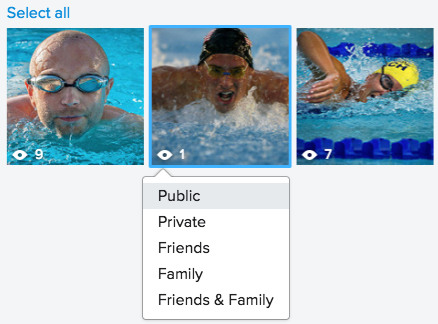 For all the photos you want to share on your SwimOffice site, you will need to make them public. Click the eyeball icon > Public. Click all photos you would like to share on your SwimOffice site. Click Add to album at bottom. Name the album, give it an optional description and click Create album. 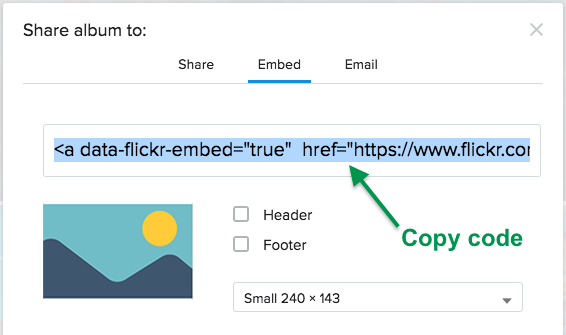 If you want to put a slideshow on your site, skip down to Method 2: Create slideshow code. Otherwise, continue to Method 1. This will generate code that places a thumbnail of your album on your SwimOffice site. When someone clicks it, it will open the album in Flickr. The downside is it takes people away from your site. Hover over the album you just made and click the Share icon. Change the size if desired. Click and copy the code in the field (Ctrl+C on Windows, Command+C on Mac). Open your SwimOffice site in a new browser tab and skip down to the Paste code in SwimOffice section. This will generate code that places a slideshow directly on your SwimOffice site. Click the album you just made. Select the URL in your browser's address bar and copy it (Ctrl+C on Windows, Command+C on Mac). Scroll down to IMAGE SOURCE, click the dropdown and select Fetch Photos from Flickr Photoset / Album. Paste the URL you copied into the Enter PhotoSet / Album ID / Full URL field. Make any other customizations and click PREVIEW & GET CODE. Copy the code in the Step 1 field. Leave this tab open because you will need to come back to copy the code in the Step 2 field. Open your SwimOffice site in a new browser tab. 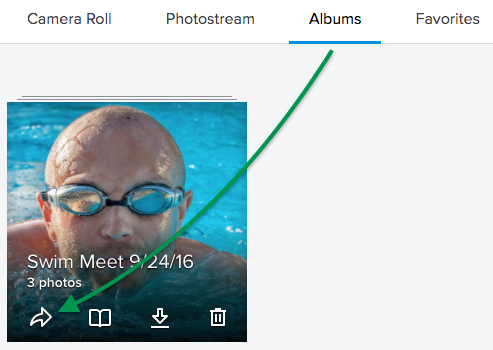 In your SwimOffice site, navigate to the page where you want to display the album. Put the cursor where you want the album or slideshow to appear and paste the code (Ctrl+V on Windows, Command+V on Mac). Go back to the FlickrEmbed site. Copy the code in the Step 2 field. Switch back to your SwimOffice site. Paste the second set of code.